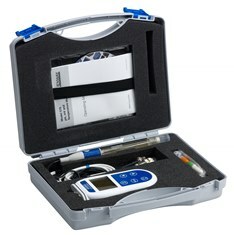 Model 570 is a general purpose hand held pH, mV and temperature meter. This model offers 2 point calibration and automatic buffer recognition. 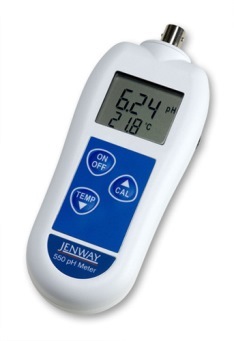 The unit simultaneously displays either temperature compensated pH readings or electrode potential and temperature. This model has a large easy to read LCD display. The integrated rubber seal ensures that the unit is completely waterproof. This meter is supplied ready to use with an epoxy bodied electrode (924 001), a temperature probe (170 100) and buffers and is supplied in a bespoke carry case. 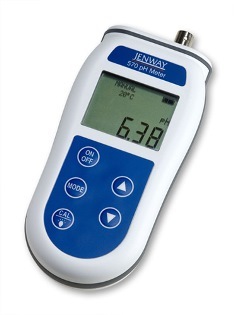 To compliment these new meters Jenway also offers a comprehensive range of application specific electrodes and consumables. Please note that these meters are not available for sale in the USA and Canada.